Please note I am now going to spread this info out over multiple posts so that I am able to start adding more pictures of the prizes. Please don't forget to look at those posts too ! I really hope you all find this useful. 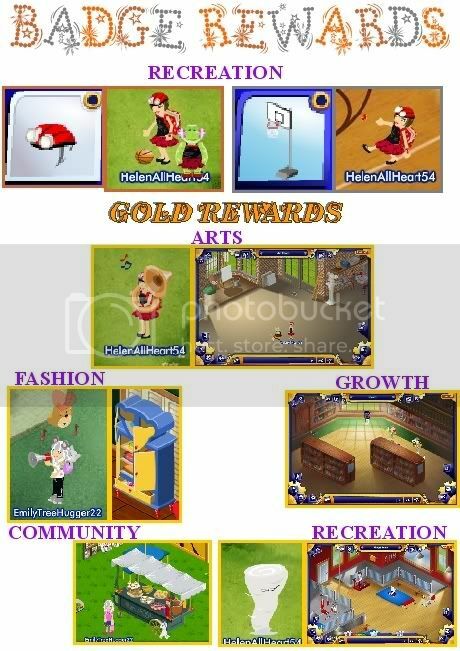 I know I'm not first to post some of these but I'm starting to tie myself in knots dodging between all the different threads there are on all these different prizes so I thought I would try & make a guide. Obviously we don't know what all the prizes are yet so as you find out please post and if possible post a picture in jpeg format & I will try & make a couple of composite photo guides like I do for the fountain and add them to the main post at a later date. 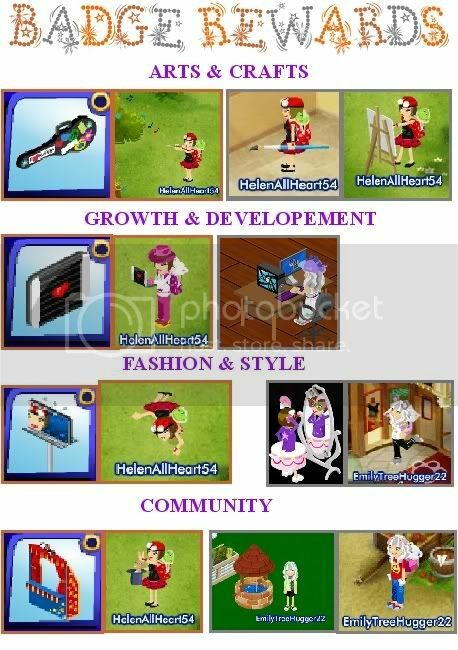 If you post information please state clearly which category ( Arts, community etc ), Which Colour badge & what Level ( Bronze level 2, Gold Level 1, Silver level 1 etc ). If you just say level 2 in arts that could be broze , silver or gold level 2. Thank you. I will update this post regularly as more prizes are discovered & also add photos later. If any of you want to post your jpegs of any new ones not written in yet it would be a great help. Hope you all find this post helpful to bring things together. 2.Growth and Developement... Words Fur Birds on Easy or Fishing. Be a Teacher or Student for 25 Points. For Cybearguides only the colour slide game is great as you get 10 points per game wi or lose. 3.Fashion and Style... Juggling Fun Lesson don't be too good LOL ! 4.Community... Grow Lots of Plants Or Coffee Shop Shifts. Easy Level Pawsitively Green Recycling Game 5 points every time. The secret backgrounds are the hidden places like the roof of the coffee shop & Tree house. You get 25 points the first time you visit them. 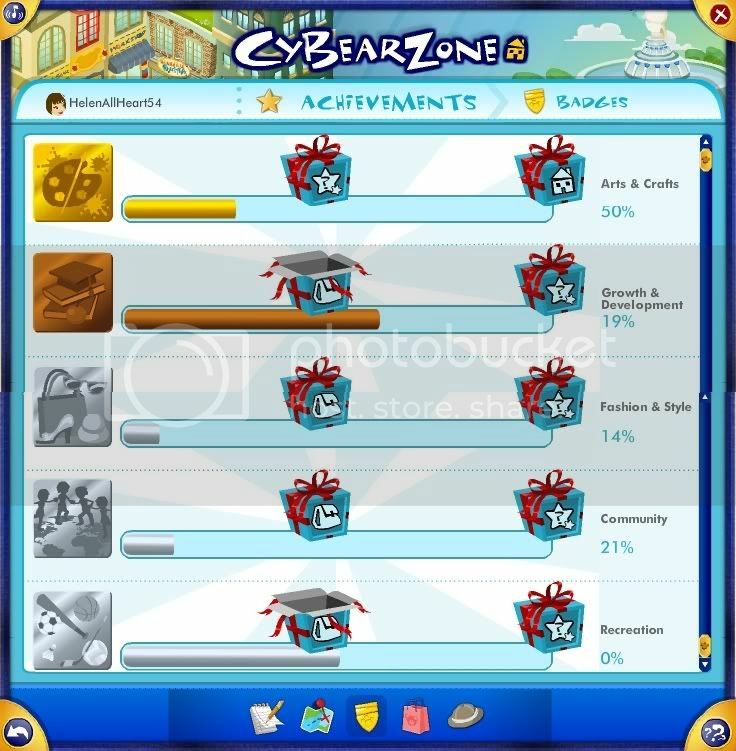 To see what badge & what percentage you are on Go to Cybearzone & click your badge icon. On the same page it shows your percentages the colour of the badges change in the display to show what level you are on. My thanks to all who provided me with new information or ideas ! THE BALLET FLATS ARE SO CUTE. its just so impossible to get up to each badge requirement . how do you people do it!? Wow! Those are great prizes! I'm definately going to try my best to achieve them! We appreciate your pictures very much! This was a very helpful thread and I'm glad you achieved them all! Thanks fur sharing! Thank You so much that is very kind of you. Knowing what you were working on though I am presuming you meant Community Gold level one rather than silver & have entered it as gold on the list. Congratulations on getting that far with community. Mine is well & truely stuck apart from when I play fountain. I can see there are some cool prizes to look forward too when it eventually gets fixed. Thanks for making an animation too ! I gonna go get that laptop !